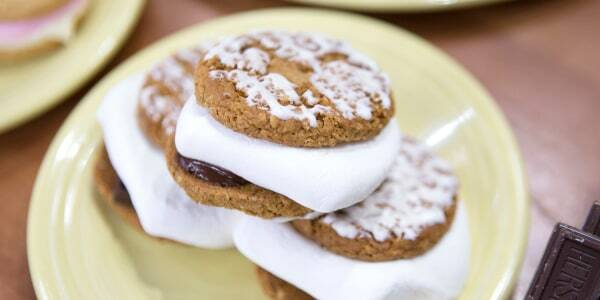 Food blogger and cookbook author Shauna Sever of The Next Door Baker is shares four of her favorite chocolaty, graham cracker-filled, marshmallow-topped hacks for National S'mores Day. 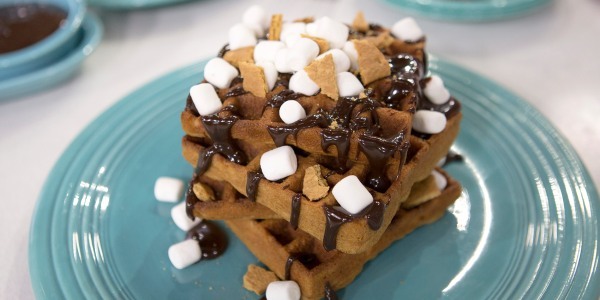 She shows us how to turn s'mores into warm waffles, ice cream, snack mix and gives us ideas to change up the classic s'mores ingredients to make new fun combos. Make s'mores even more exciting by swapping the traditional ingredients with these fun flavors. Hot s'mores fresh from the campfire are a classic. But adding them to cool, creamy ice cream lets you enjoy the chocolate, graham and marshmallow combo with a totally different texture and temperature sensation. S'mores Dessert Waffles make waffles even more wonderful by mixing graham cracker crumbs right into the batter, and topping them with chocolate sauce and mini marshmallows. Give standard snack mix a sweet s'mores twist with chocolate chips and mini marshmallows. Combine all in a large bowl. Store in an airtight container in a cool, dry place.